Fox’s The Exorcist season one episode five dropped the bombshell that Angela Rance is actually Regan MacNeil. She changed her name after her mother made the rounds promoting a book about the exorcism, and episode six begins with footage of an old interview on ‘Wake Up San Diego’ featuring Regan and her mother, Chris, discussing Chris’ book, The Devil in My Daughter. Regan is quiet but not shy, and doesn’t like talking about the time period when she was possessed. She remembers vague details, including not being able to control her body. She also remembers a voice asking her to come closer, but that’s about all she recalls – or at least admits remembering. She’s asked if maybe there’s another explanation other than possession, but she’s positive it was real. Kat (Brianne Howey) makes small talk with the grandmother she’s never met as Angela (Geena Davis) can be heard in the background angry at Henry (Alan Ruck) for letting Chris (Sharon Gless) into their home. Chris tells Kat she looks like a young Chris MacNeil, especially her mouth, and wonders if anyone has ever mentioned that to her. In the kitchen, Henry’s angry Angela never told him about Chris, while in the living room Chris explains she tried to track her daughter down but couldn’t find her. She saw the news report about Casey (Hannah Kasulka) being missing and that’s how she found Regan/Angela. Kat wants to know if Casey’s possession is like Regan’s, and Chris says she hopes not. Kat admits she called the police and believes it’s her fault Casey’s missing. Henry tells Angela that Chris can stay because she may be able to use her fame to draw more attention to finding Casey, and Kat’s okay with giving up her bed for a few nights so her grandmother can stay with them. The police and volunteers are searching for Casey, and Father Tomas is also volunteering as are Casey’s family members. At the volunteer center, Angela remains angry about her mother’s involvement and having to revisit her own past. But even at the volunteer center Chris is being approached by fans, proving Henry right in believing the search for Casey will get more attention with a well-known actress involved. Angela meets in private with Father Tomas (Alfonso Herrera) and Marcus (Ben Daniels), and both are angry she didn’t tell reveal her history. Father Tomas says the police think someone helped Casey because of the strength it took to take out the ambulance workers. Marcus believes the demon will ultimately force Casey to submit and they will become integrated in Casey’s body. That would make the possession permanent, destroying the soul so that an exorcism wouldn’t matter. If they don’t find Casey quickly, there may be nothing left to save. Angela says when it happened to her, people thought there was nothing left of her but she was still in there. Marcus leaves the room angry, telling Tomas he’s off to hunt for Casey. He needs a police scanner and when Tomas offers his help, Marcus will have none of it. He reminds Tomas he’s been compromised but Tomas says it won’t happen again. Marcus thinks Tomas is a good man, but he has too much to lose and can’t be an exorcist. A police press conference asks for the help of the public and Father Tomas announces a $100,000 reward for Casey’s recovery. Chris takes the time to announce Casey is her granddaughter while a woman yells, asking about the nine people of color who were murdered just blocks away. The attention has been focused on Casey and not the murder victims, and citizens are understandably angry. Meanwhile, we see the body parts stolen from the murder victims are being placed on trays and burned, with the ashes collected in what looks like a ceremonial jar. The police return to the Rance house and ask about Marcus. They want to know about the exorcism and they have more questions for the priest, with Angela lying that Marcus was the only priest involved. The police know Casey broke a man’s jaw and was in the psych ward, which makes them question whether she actually attacked the people in the ambulance. Angela looks at the crime scene photos and asks if the victims had families. Kat finds the ‘Wake Up San Diego’ interview online and Chris tells her the book wasn’t her finest hour. Chris tries to explain the scandals back then and how it affected her career after she was labeled a devil worshipper and much worse. The publicity was bad for her career and she was dropped by the studio. Kat asks why the demon chose her mother, and Chris says they were staying in a house where there was a Ouija board. Regan loved it and that’s when she met the demon, Captain Howdy. Chris warned her to stop but didn’t pay enough attention. Kat says her mom was just a kid and didn’t ask for any of this. Angela’s outside the bedroom door listening in and hears her mom take the blame for what happened all those years ago. She knows she wasn’t there for her daughter. At the volunteer center, Maria Walters (Kirsten Fitzgerald) is fine with the fact the donation was used for the reward. She asks about the exorcism he wanted to perform and Father Tomas doesn’t want to talk about it. She invites him to an event that night at her house and tells him he’ll meet influential people if he attends. His meeting with Maria is interrupted by Jessica (Mouzam Makkar) who shows up unexpectedly. Marcus and Father Bennett (Kurt Egyiawan) pay another visit to the tour bus driver and host who are experts on the supernatural occurrences taking place in Chicago. They’ve found a surprising connection between Maria Walters and the weird events, and they’ve discovered the vans that have been picking up people on the streets are owned by the Walters’ company. The people who accept a ride in the van are never seen again. They’ve also learned the Walters have given $1.8 million donation to the Friars of Ascension, the group sponsoring the Papal visit. Angela mans the phones at the volunteer center and a male caller asks her if she thinks God is punishing her for being a bad little girl. He calls her Regan and says she wanted him in her and so does her daughter. He offers to tell her where she is, saying Casey is standing right behind her. Angela looks up and sees a demon behind her and screams. Jessica and Tomas go for a walk and he asks if she’s feeling guilty. She says the world owes them a little happiness and she’s not apologizing for what they did. She left her husband, handing him a key to a new apartment she just rented. Tomas says he won’t visit her there, and Jessica says that’s fine. Back at the volunteer center, Henry wants to know who the woman is in the photo album that Angela’s always claimed was her mother. Angela confirms it’s just a random stranger, and Henry’s disappointed half of what he knows isn’t true. Angela says she’s never lied to him about their life together, but Henry makes the important point that she didn’t even tell him the truth after it started to happen to Casey. Tomas returns to the volunteer center in a horrible mood, but then he hears one of the volunteers talking about a pack of wild dogs going crazy in a neighborhood. He texts Marcus the news. Back at the Rance house, Chris is talking to a reporter about their lives. Angela overhears and throws the reporter out, while Chris tries to explain she was just attempting to help. Angela’s done with her intrusion into their lives and tells her to pack up her things. Angela screams about her family following apart and how Chris is making this about her, which is what she did when Angela was a child. She asks her mom how she could have exploited her as a child, and Chris says she did it because they didn’t have any money. It’s then that Angela admits she always knew where her mom was, but never reached out. A call comes and Angela takes it. It’s the coroner’s office and they may have found Casey. Back at Maria’s exclusive party, priests thank Maria for her hard work while Father Bennett asks the professor if he’s ever seen a demon. Father Bennett says he has and as he walks away, Maria and her guests exchange looks. The Rance family arrives at the coroner’s office and are forced to make their way through dozens of photographers and reporters. Father Tomas is also there and Chris tells him she wished she’d stayed involved in Angela’s life. Angela and Henry are taken back to view the body and it’s not Casey. Upon receiving the news, Angela is finally able to hug her mother and cry. Marcus investigates the pack of dogs and finds rats fleeing a tunnel. Homeless people are in the tunnel, acting as if their bodies aren’t theirs. They’re swatting at unseen things, and one man reaches out to Marcus to stop it. Marcus continues to call out for Casey as he ventures further into the tunnel. Marcus has to yell, “In the name of Christ, get back!” as the homeless beg him to stop what’s happening to them. Casey crawls on the wall and then crawls upside down and backwards toward Marcus, which is incredibly creepy! Meanwhile, Maria and her guests receive the news that it wasn’t Casey at the morgue. A latecomer – a priest – makes a big entrance telling a story about a farmers market and knocking over apples. He wonders why Father Tomas isn’t there, and the group tells him Father Tomas will be a tough nut to crack. Tomas breaks his promise and shows up at Jessica’s apartment. He tells her they can’t sleep together, and she’s okay with that. At Maria’s gathering, members of the Friars of Ascension sit around a table where the priest presents the container filled with ashes. He asks for the devil to rise and walk among them. They all hold hands as he requests the devil’s presence. He scoops up a handful of ashes and blows it into the air. They all ask for the devil to take control of their bodies, with Maria begging for him to take her. The ashes choose someone else and that man gasps loudly, and then looks around the group. He stands, smiling, while everyone (except Maria) hug and laugh. Marcus has made his way to the beach where he finds Casey eating a bird, growling. It’s nearly pitch black outside and when he approaches Casey in the water, she attacks him. They struggle and he’s finally able to hold on to her, dunking her under the water, and trying to rid Casey of the demon. She stops struggling and then stops moving. He holds her in his arms and then she opens her eyes and gasps for air. She tells Marcus the demon is coming back and asks for his help. 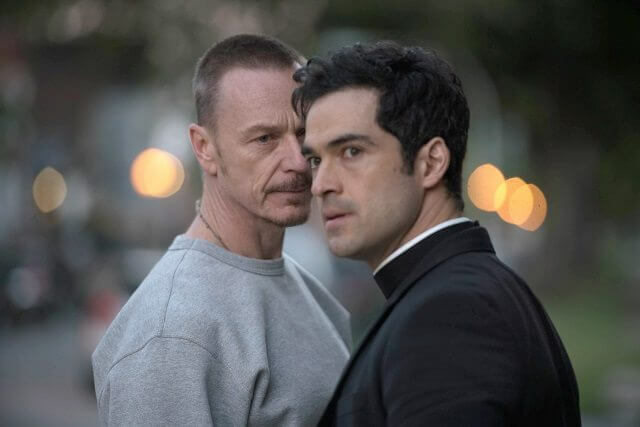 The Exorcist airs on Fox on Fridays at 9pm ET/PT.